As a kid, when our family headed into town for a special treat night at the W & E drive in, I invariably agonized over choosing the best ice cream flavour for that day - but we could always count on my mum getting her standard favorite: a maple walnut sundae. Good times. 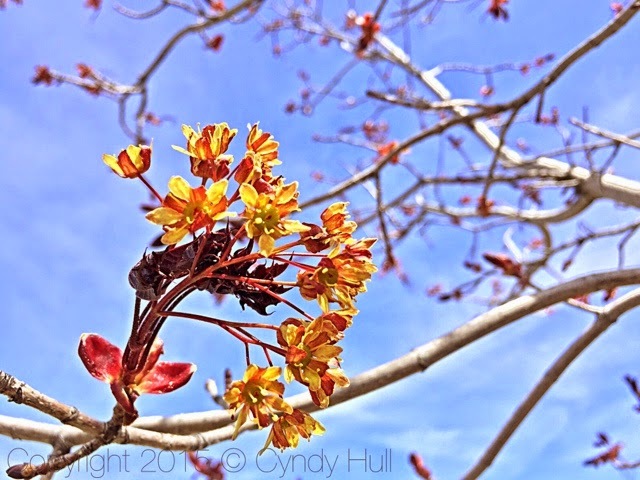 Today's pic is a whole other version of mapley goodness - a bursting, bright fountain of delicate flowerets heralds the unfurling of tender-new claret-hued maple leaves. Goodness all around - before our eyes, in our hearts' memories - ours to feast upon. Memories of simpler times - I feel 10 years old again. Let's find a photo to bring in memories of our collie Lynk having his own ice cream cone. Lynk was the best farm dog ever! Have to confess, I sometimes buy Maple Walnut Ice Cream just for nostalgia - well, plus it's good - Mum had valid reason for sticking with it!